Larrakia elder Eric Fejo with former Darwin Operations Manager Filippo Meacci. Australia’s Northern Territory (NT) has a population of just over 245,000, with 30 percent identifying as being of Aboriginal and Torres Strait Islander origin. Eighty-five percent of the coastline in the Darwin area is Aboriginal-owned and 51 percent of NT land is Aboriginal land. The greater Darwin region is home to about 2,000 Larrakia people, who are the Traditional Owners of the land and water in the area. They have a special connection to the saltwater, which they believe provides them with strength and health. As the majority interest holder of the Darwin Liquefied Natural Gas (LNG) plant in the NT, we place a top priority on recognizing and respecting the Larrakia culture. A Larrakia person can welcome visitors by inviting them into the saltwater and washing down their face or arms. Doing so leaves their smell and sweat in the water, which means the country and ancestors of the Larrakia are aware of the presence of visitors. 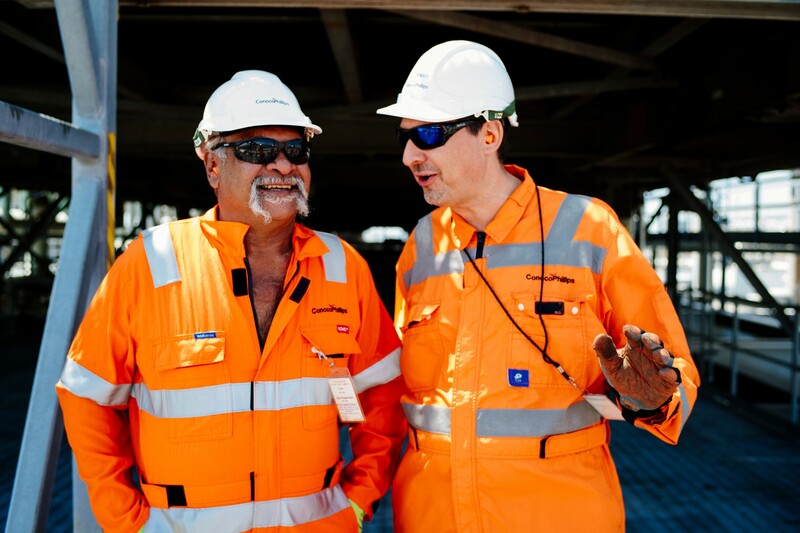 Darwin LNG has an agreement with the Larrakia people that includes commitments and aspirations across cultural recognition and activities, contracting and business opportunities and employment and training. This agreement is known as the Wickham Point Deed. We work with Larrakia family representatives, who form the Wickham Point Deed Reference Group, to provide us with guidance and feedback on a range of activities concerning our Larrakia and Aboriginal engagement. The Wickham Point Deed Reference Group have visited Darwin LNG for a full tour of the facility. The tour allowed the group to see the inner workings of an LNG plant and to share insight and detail about sites of cultural significance located near Darwin LNG, which may guide cultural awareness and future recognition. We’ve also renewed our focus on integrating Larrakia culture into existing partnerships within Darwin’s community investment portfolio. These partnerships provide a great foundation to showcase Larrakia culture, building pride in the community. We’ve partnered with the National Indigenous Music Awards (NIMAs), a national event to celebrate and reflect upon the contribution by Indigenous musicians to Australia’s cultural landscape, for over 10 years. The event brings together visitors from remote Aboriginal communities, tourists, Darwin residents and renowned performers. It is broadcast nationally each year. In 2018, we sponsored the Welcome to Country performance featuring dances and music from the Kenbi Dancers, a Larrakia dance group, against a backdrop of aerial photos of local landscapes. The performance was the opening act for a night that ended with the Kenbi Dancers winning the NT Traditional Music Award. Clontarf Foundation at NT City2Surf. We also support the Clontarf Foundation, a national program to improve the education, discipline, life skills, confidence and employment opportunities of young Aboriginal and Torres Strait Islander men. The Clontarf Foundation provides guidance to over 6,500 boys in 97 schools across Australia. Our long-term partnership with the foundation includes staff involvement at career fairs and participation in mock-interviews and informal presentations. 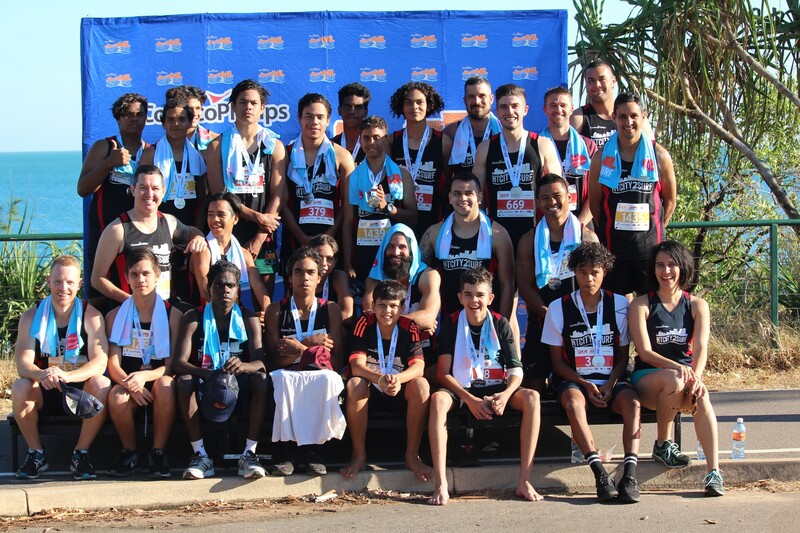 We also involve students in activities offered by our other community partners such as the ConocoPhillips NT City2Surf race, where students run as part of the ConocoPhillips team and participate in the post-race breakfast. In 2017, work experience at the NIMAs was offered to Clontarf Foundation students interested in music, stage/event management, and sound and lighting production. In 2018, a group of students also worked in event preparation and the scope of participation is anticipated to increase in the future. Across all community investment partnerships, we aim to actively weave in a Larrakia presence by facilitating opportunities for a Welcome to Country address, Acknowledgement of Country in program booklets, artwork and other cultural initiatives that reflect our respect for the Larrakia as Traditional Owners of land in the Darwin region. In 2018, we developed a range of new career training opportunities for Larrakia people to provide opportunities to enter the LNG industry workforce. Programs include training for technical plant operators, apprentices, warehouse and logistics operators and various administrative positions. 2018 NT Training Award recipients Kimberly Brewster and Sonny Malmerin-Fejo. “Two of our most recent trainees received awards at the 2018 NT Training Awards. 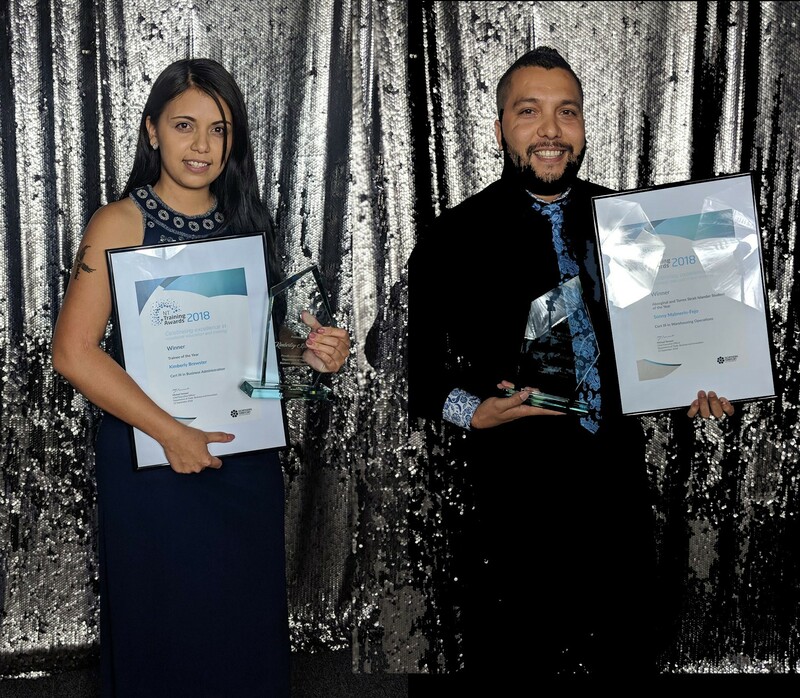 Sonny Malmerin-Fejo was named the Aboriginal or Torres Strait Islander Trainee of the Year and Kimberly Brewster was named Trainee of the Year. Both proceeded to the prestigious Australian Training Awards, where Kimberly was awarded Australian Trainee of the Year. We are incredibly proud of what they have achieved and are delighted that their hard work and professional development has been recognized by the broader community at both a local and national level,” said Carly Sherren, Senior ConocoPhillips Human Resources Business Partner. Additionally, we’ve conducted an Operator Training program since 2010. Originally known as the Darwin Operations Centre Training Academy (DOCTA) program, it was initially designed to encourage local employment within the Northern Territory. Australia was undergoing a rapid expansion of the LNG industry, and since there were few local, experienced operators in the local market, the DOCTA program sought to help long-term residents develop transferrable process or trade skills. Since then, 36 people from six training classes have completed the program. The recently convened seventh class is the first in collaboration with industry peer INPEX. There were more than 1,200 applicants for the program and applications from women and Aboriginal and Torres Strait Islanders were received in record numbers. Six trainees have started at Darwin LNG, including four women (one who is Aboriginal) and a Larrakia man. We established a partnership with Charles Darwin University (CDU) to provide capacity building opportunities to Aboriginal and Torres Strait Islander people. This partnership aims to address skills shortages through training programs that have been developed in consultation with the Wickham Point Deed Reference Group. In 2017-2018 the program offered two heavy truck driving programs to Aboriginal students. Participants gained both classroom and on-the-road skills and worked with a host employer. The program was repurposed for 2019, into a comprehensive, 20-week health services program with 12 weeks of classroom time at CDU and eight weeks of practical, on-the-job training. Upon completion, participants will be certified to work with geriatric and disabled patients, both areas of need throughout the NT. While cultural recognition and pride are developed and maintained through our community investments, sustainable changes are made through education, training and employment opportunities. “Our engagement with the Larrakia, and Aboriginal and Torres Strait Islander people in Darwin relies on collaboration and open dialogue. We remain committed to genuinely contributing to the social and cultural fabric of communities where we operate,” said Kayleen Ewin, ConocoPhillips Vice President Sustainable Development and External Affairs.